This article is about the amusement ride. For other uses, see Carousel (disambiguation). "Merry-go-round" redirects here. For other uses, see Merry-go-round (disambiguation). 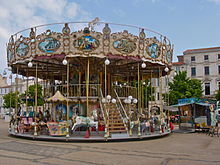 A carousel (American English: from French carrousel and Italian carosello), roundabout (British English), or merry-go-round, is a type of amusement ride consisting of a rotating circular platform with seats for riders. The "seats" are traditionally in the form of rows of wooden horses or other animals mounted on posts, many of which are moved up and down by gears to simulate galloping, to the accompaniment of looped circus music. This leads to one of the alternative American names, the galloper. Other popular names are jumper, horseabout, and flying horses. Carousels are commonly populated with horses, each horse weighing roughly 100 lbs (45 kg), but may include a variety of mounts, for example pigs, zebras, tigers, or mythological creatures such as dragons or unicorns. Sometimes, chair-like or bench-like seats are used, and occasionally mounts can be shaped like aeroplanes or cars. The "roundabouts" or "merry-go-rounds" installed in playgrounds are usually somewhat different devices: simple, child-powered rotating platforms with bars or handles to which children can cling while riding. 2 Similar uses of the term "carousel"
The modern carousel emerged from early jousting traditions in Europe and the Middle East. Knights would gallop in a circle while tossing balls from one to another; an activity that required great skill and horsemanship. This game was introduced to Europe at the time of the Crusades from earlier Byzantine and Arab traditions. 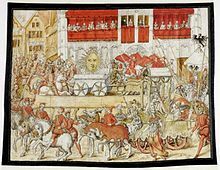 The word carousel originated from the Italian garosello and Spanish carosella ("little battle", used by crusaders to describe a combat preparation exercise and game played by Turkish and Arabian horsemen in the 12th century). This early device was essentially a cavalry training mechanism; it prepared and strengthened the riders for actual combat as they wielded their swords at the mock enemies. By the 17th century, the balls had been dispensed with, and instead the riders had to spear small rings that were hanging from poles overhead and rip them off. Cavalry spectacles that replaced medieval jousting, such as the ring-tilt, were popular in Italy and France. The game began to be played by commoners, and carousels soon sprung up at fairgrounds across Europe. At the Place du Carrousel in Paris, an early make believe carousel was set up with wooden horses for the children. By the early 18th century carousels were being built and operated at various fairs and gatherings in central Europe and England. Animals and mechanisms would be crafted during the winter months and the family and workers would go touring in their wagon train through the region, operating their large menagerie carousel at various venues. Makers included Heyn in Germany and Bayol in France. These early carousels had no platforms; the animals would hang from chains and fly out from the centrifugal force of the spinning mechanism. They were often powered by animals walking in a circle or people pulling a rope or cranking. Viewed from above, in the United Kingdom, merry-go-rounds usually turn clockwise (from the outside, animals face to the left), while in North America and Mainland Europe, carousels typically go counterclockwise (animals face to the right). By the mid-19th century the platform carousel was developed; the animals and chariots were fixed to a circular floor that would suspend from a centre pole and rotate around. These carousels were called dobbies and were operated manually by the operator or by ponies. In mid-19th century England, the carousel became a popular fixture at fairs. 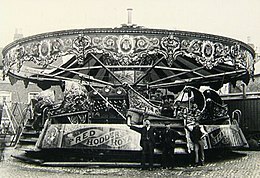 The first steam-powered mechanical roundabout, invented by Thomas Bradshaw, appeared at the Aylsham Fair in about 1861. It was described by a Halifax Courier journalist as "a roundabout of huge proportions, driven by a steam engine which whirled around with such impetuousity, that the wonder is the daring riders are not shot off like cannon- ball, and driven half into the middle of next month." Soon afterwards, English engineer Frederick Savage began to branch out of agricultural machinery production into the construction of fairground machines, swiftly becoming the chief innovator in the field. Savage's fairground machinery was exported all over the world. By 1870, he was manufacturing carousels with Velocipedes (an early type of bicycle) and he soon began experimenting with other possibilities, including a roundabout with boats that would pitch and roll on cranks with a circular motion, a ride he called 'Sea-on-Land'. Savage applied a similar innovation to the more traditional mount of the horse; he installed gears and offset cranks on the platform carousels, thus giving the animals their well-known up-and-down motion as they travelled around the center pole – the galloping horse. The platform served as a position guide for the bottom of the pole and as a place for people to walk or other stationary animals or chariots to be placed. He called this ride the 'Platform Gallopers' . He also developed the 'platform-slide' which allowed the mounts to swing out concentrically as the carousel built up speed. Fairground organs (band organs) were often present (if not built in) when these machines operated. Eventually electric motors were installed and electric lights added, giving the carousel its classic look. Carousel built in 1905 by Gustav Dentzel which is still operational in Rochester, New York. These mechanical innovations came at a crucial time, when increased prosperity meant that more people had time for leisure and spare money to spend on entertainment. It was in this historical context that the modern fairground ride was born, with Savage supplying this new market demand. In his 1902 Catalogue for Roundabouts he claimed to have "... patented and placed upon the market all the principal novelties that have delighted the many thousands of pleasure seekers at home and abroad." In the United States, the carousel industry was developed by immigrants, notably Gustav Dentzel of Germany and Charles W.F. Dare from England, from the late 19th century. 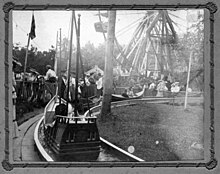 Several centers and styles for the construction of carousels emerged in the United States: Coney Island style – characterized by elaborate, and sometimes faux-jeweled, saddles – with Charles I. D. Looff; Philadelphia style – known for more realistically painted saddles – with Dentzel and the Philadelphia Toboggan Company; and Country Fair style – often with no saddles at all – with Allan Herschell and Edward Spillman of western New York, and Charles W. Parker of Kansas. The golden age of the carousel in America was the early 20th century, with large machines and elaborate animals, chariots, and decorations being built. Similar uses of the term "carousel"
On some playgrounds, small manually powered carousels exist. At airports, rotating conveyors in the baggage claim area are often called luggage carousels. Various photographic slide projectors, notably those made by Kodak until 2004, used rotating trays or magazines called carousels to hold the slides and were often known as "carousel projectors." The National Carousel Association maintains a list of Historic Carousel Award winners, primarily focused on carousels in Canada and America. The oldest existing carousel made in 1779 to 1780 stands in Germany at the Wilhelmsbad Park in Hanau. c.1894 High Park, CNE grounds, Munro Park O. L. Hicks Miniature boats (replicas of Columbus' ships) travelled in a circular trough. Chains pulled the boats. Location is CNE grounds which was second site. Name Pinta is visible on bow of right hand boat. Location is Munro Park, Toronto which was third site where this attraction was installed. c.1895-1903 Efteling. Kaatsheuvel. Brabant. The Netherlands Hendrik Janvier This carousel was built between 1895 and 1903 by designer Hendrik Janvier (1868–1932). Janvier was the progenitor of the famous Dutch funfair family Janvier and is seen as the founder of the Stoormcarrousel tradition. He used tools from different manufacturers, because there did not yet exist a dedicated stoomcarrousel manufacturer yet. Upgrades and renovations were made in the years after 1903. Today this old stoomcarrousel is located in the Efteling (Themepark). In 1955 the Efteling bought the ride for ƒ 15.475,-. (Gulden) from the Janvier family. It reopened in 1956. Originally, the price for a ticket to make a ride, was only 5 cents. Contains: 22 Horses, 4 Coaching's, 2 Pigs & 2 clowns. The King Arthur Carrousel has existed since 1932 and was moved to Disneyland in 1954. It is an assembly of two carousels. Walt Disney wanted it to have four courses of all jumpers. The remaining chariot woodwork was repurposed as the "Calliope" tenders of Casey Jr. Circus Train powered gravity coaster. The carousel at Harper Motors is an iconic landmark on the North Coast of California. It was bought by the dealerships owner Harvey Harper in 1991, after purchase this 1947 Allan Herschell Carousel was shipped to Oakland by train and drive to Eureka in a semi-truck. It took a year to assemble on site. It was refurbished and repainted in 2013 which caused the ride to be closed for a month. It is open daily free of charge to the public from 12-4 except on holidays and when inclement weather doesn't allow for riders. The carousel at Phantasialand in Germany is one of the biggest in the world, made by Preston & Barbieri one historical amusement ride factory in Italy. The world's only two-row stationary carousel built from an original Dentzel blueprint left in existence, the Highland Park Dentzel Carousel and Shelter Building, is located in Highland Park in Meridian, Mississippi. In May 2005, William Henry Dentzel III, built the world's first solar-powered carousel. The carousel operates during Solfest at the Solar Living Institute in Hopland, California. There is only one carousel in the world that rides in a waving motion - "Over the Jumps: The Arkansas Carousel" in Little Rock, Arkansas. It is also the only remaining wooden track carousel built by the Herschell & Spillman Company, and one of only four track carousels still in existence. 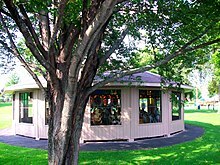 The carousel at Conneaut Lake Park in Conneaut Lake, Pennsylvania is the last T.M. Harton Carousel that is still in operation and its Artizan band organ is one of two known of the same model in the world. In 2007, SeaWorld Orlando opened Sea Carousel, Florida's first aquatic carousel. In 2012, Buttonwood Park Zoo opened an Americana carousel by Chance Rides. The two double-decker Columbia Carousels built by Chance Rides and located at Six Flags Great America and California's Great America are the two tallest carousels in the world. The Merry-Go-Round at Bear Mountain State Park features hand-painted scenes of the Park and 42 hand-carved seats of native animals including black bear, wild turkey, deer, raccoon, skunk, Canada goose, fox, swan, bobcat, rabbit, and more. On Canada Day 2016, a new attraction was opened in Downtown Markham, Ontario. The Pride of Canada Carousel was commissioned by Christopher Bratty, current president of the real estate and development firm The Remington Group. The carousel was produced and originally envisioned by Shelley M. Shier of Broadway Bound Fine Arts and Entertainment for The Remington Group. The carousel sits inside a glass pavillon designed by Sheldon Levitt from Quardrangle Architects. The carousel itself features 44 ride-able reusable material sculptures representing different elements of Canadian culture. It was designed by artist Patrick Amiot who worked with the Brass Ring Carousel Company to build the ride. Ice floe carousels have been constructed on frozen lakes. In Mary Poppins, Mary, Bert, and the children ride a merry-go-round, then leave the carousel on their horses to go off on a fox hunt and a horse race. In the film Charade, near the end, there is a scene where appears a carousel in the background with the music of the main theme, a Parisian waltz composed by Henry Mancini (Charade carousel) played with bells. In the film Logan's Run, the residents of a domed city of the future are doomed to die on their 30th birthday, unless they can be "renewed" in a ritual known as "carousel". In Something Wicked This Way Comes by Ray Bradbury, the carnival's carousel can cause riders to become younger or older depending on the direction, left and right in which they ride. Carousel (1945) was a Broadway musical featuring hit songs such as "If I Loved You" and "You'll Never Walk Alone". 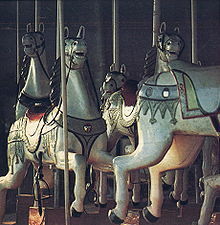 The protagonist, Billy Bigelow, is a carousel barker. In the dramatic climax scene of Alfred Hitchcock's Strangers on a Train (1951) the hero and the villain struggle on a carousel. David Carradine's 1983 film Americana revolves around a Vietnam veteran's obsession with the restoration of an abandoned carousel. In the Australian children's picture book The Carousel by Ursula Dubosarsky, illustrated by Walter di Qual, after an exhilarating ride on a carousel, a child has a semi-mystical vision of the carousel horses breaking free from the wheel and galloping across the world. The 1930s novelty song, The Merry-Go-Round Broke Down, is the theme song for the Looney Tunes series of cartoons by Warner Bros. The classic children's television programme The Magic Roundabout uses a carousel as its central motif. The 1990s children's TV show Playdays had a carousel called Rosie as the central motif for Wednesday episodes from 1992 to 1997, presented and maintained by Mr. Jolly. The classic film The Sting features a large indoor carrousel adjacent a brothel, where the Madame allows the girls to ride on slow nights. The ride is in all four RollerCoaster Tycoon games. The three installments of the book series Kingdom Keepers: The Return  by Ridley Pearson  features the carousel from Disneyland being used as a time machine to the opening of Disneyland Park. In the 2016 film Miss Peregrine's Home for Peculiar Children a carousel is featured along with other similar fairground rides on one of Blackpool's famous piers. The carousel appears when a character in the film that possesses the peculiarity of super strength rips a horse from the carousel and uses it to immobilize one of the other characters in the film known as a "Hollow". MTV's Teen Wolf (Season 6, "Ghosted") in a scene of a town called Canaan, a street fair was happening and there is a carousel with one of the horses covered in blood. Town Square Carrousel at Adventureland in Altoona, Iowa (Chance-Morgan). Also has a decorative crown for a top. ^ International Museum of Carousel Art. "A Brief History of the Carousel". Archived from the original on 4 March 2017. Retrieved 24 July 2008. ^ "A Brief History of the Carousel". Archived from the original on 4 March 2017. Retrieved 24 July 2008. ^ "Introduction To Carousel Art: American Antiques - American folk art - carousel horse". ^ "Fairground Rides - A Chronological Development". University of Sheffield. Archived from the original on 11 August 2011. ^ "Frederick Savage, Victorian Fairground Manufacturer of King's Lynn". ^ Antiques Roadshow, Spokane, Washington, broadcast 4 August 2007. ^ "Carousels with Awards and Special Features". National Carousel Association. Retrieved 25 September 2017. ^ "National Carousel Association - Moved!". ^ "National Historic Landmarks Program (NHL)". Tps.cr.nps.gov. 27 February 1987. Archived from the original on 23 November 2010. Retrieved 26 June 2014. ^ "Zoo carousel, 1970s". Culture Victoria. Retrieved 17 March 2019. ^ "EXPO 67: THEN AND NOW - Tourisme Montréal Blog". 9 May 2012. Retrieved 11 August 2016. ^ Hustak, Alan (4 May 2007). "Spirit of Drapeau makes appearance to launch La Ronde's 40th season". The Gazette. ^ "Darling Harbour Carousel and Band Organ". Property New South Wales. Retrieved 24 September 2017. ^ "The Ronald Engine Accepted". Toronto Globe. Toronto. 25 April 1895. p. 2. ^ "The Pleasure of Summer". Toronto Globe. Toronto. 24 May 1899. p. 4. ^ "Carters Steam Fair :: Jubilee Steam Gallopers". www.visit.carters-steamfair.co.uk. Retrieved 7 December 2015. ^ Virginia Currie; Ann Turner & Catherine Cockshutt (April 1976). "Pullen Park Carousel" (pdf). National Register of Historic Places - Nomination and Inventory. North Carolina State Historic Preservation Office. Retrieved 1 May 2015. ^ Kathleen LaFrank (January 2004). "National Register of Historic Places Registration: Forest Park Carousel". New York State Office of Parks, Recreation and Historic Preservation. Retrieved 16 January 2011. See also: "Accompanying 35 photos". ^ "Dentzel Menagerie Carousel". cityofrochester.gov. Retrieved 17 July 2016. ^ "Lakeside Park Carousel - St. Catharines". Stcatharines.ca. Retrieved 26 June 2014. ^ Hartlaub, Peter (12 July 2009). "Bay Area clinging on its classic carousels". San Francisco Chronicle. Retrieved 19 July 2017. ^ Lee-Shanok, Philip (10 September 2017). "'Carouselgate' could mean Centreville carousel won't be leaving, at least for now". CBC News. Retrieved 25 September 2017. ^ "From fireworks to festivals: What to do in Toronto this long weekend". CBC News. 18 May 2018. Retrieved 17 March 2019. ^ "1908 Looff Carousel". Heritage museums & gardens. Retrieved 25 September 2017. ^ "Balboa Park Carousel". Balboa Park. Retrieved 24 September 2017. ^ "National Register of Historic Places in Contra Costa County". Retrieved 3 January 2013. ^ "Census of Classic Wood Carousels". National Carousel Association. Retrieved 3 January 2013. 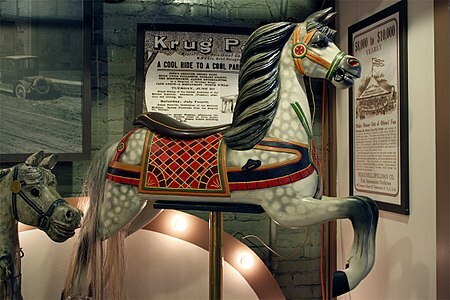 ^ "Historic Nunley's Carousel at Museum Row". cradleofaviation.org. Retrieved 3 January 2013. ^ "Grand Ole Carousel". Six Flags St. Louis. Retrieved 16 December 2018. ^ Carousel History page that is no longer available at santamonicapier.org, but is archived at archive.org. ^ "The Museum's Exhibits". Archived from the original on 23 February 2012. Retrieved 23 February 2012. ^ Jacques, Charles Jr. (1982). Kennywood...Roller Coaster Capital of the World. Vestal, New York: The Vestal Press Ltd. pp. 174–177. ISBN 0-911572-24-4. ^ Keeter, John (9 May 2017). "What Goes Around..." Kings Island. Retrieved 12 October 2018. ^ "Antique Carousel | Canada's Wonderland". www.canadaswonderland.com. Retrieved 10 August 2016. ^ "CWMania • Ride Info - Antique Carrousel". www.cwmania.com. Archived from the original on 12 August 2016. Retrieved 10 August 2016. ^ "Holyoke's Happiness Machine: The History of the Holyoke Merry-Go-Round". The Holyoke Merry-Go-Round. Retrieved 25 September 2017. ^ "Casey Jr. Circus Train". ^ "Another go-round: Harper family carousel closed for restoration". Retrieved 11 August 2016. ^ "Preston & Barbieri: Best rides ever!". ^ "California Carousel". Roadside Architecture.com. Retrieved 3 January 2013. ^ "Gallery 2: Cloud Room". Dentzel.com. Retrieved 3 January 2013. ^ Moschke, Will (2011). "35 Years at the Great America Parks". RollerCoaster! Magazine. 32 (4): 6. ISSN 0896-7261. ^ "Markham to open $10M scrap-metal carousel on Canada Day | Toronto Star". thestar.com. Retrieved 15 August 2016. ^ "Introducing the Pride of Canada Carousel, an ode to the country in the revitalized core of Markham". ^ "Pride of Canada Carousel Spins Up in Downtown Markham | Urban Toronto". urbantoronto.ca. Retrieved 15 August 2016. ^ "Pride of Canada Carousel - Carousel | Downtown Markham". www.downtownmarkham.ca. Retrieved 15 August 2016. ^ Chan, Casey. "Crazy people chainsawed a frozen lake to make a spinning ice carousel". Gizmodo. Gawker Media. Retrieved 7 August 2015. ^ "The Carousel - Penguin Books Australia". ^ "The Kingdom Keepers". thekingdomkeepers.com. Wikimedia Commons has media related to carousel. This page was last edited on 12 April 2019, at 20:46 (UTC).